WASHINGTON, D.C. -- The leaders of some of the United States' closest allies -- Canada, the U.K., Germany and Israel -- are viewed more favorably than unfavorably by Americans, but with favorable ratings for each below 50%. At the same time, two leaders from countries with more fractured relationships with the United States -- North Korea and Russia -- earn minimal favorability. Canadian Prime Minister Justin Trudeau and Great Britain's Theresa May earn the highest favorable ratings of the six country leaders tested in Gallup's Aug. 1-12 survey: 48% and 46%, respectively. German Chancellor Angela Merkel (39%) and Israeli Prime Minister Benjamin Netanyahu (37%) score slightly lower. 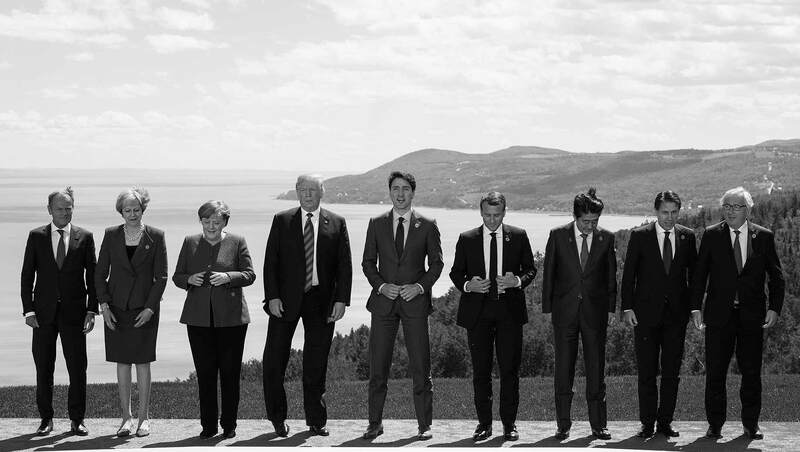 When factoring in the unfavorable ratings of these leaders, Trudeau and May have net favorable ratings of +24 and +25, respectively, while Merkel's net rating is +14 and Netanyahu's +8. Between 28% and 35% of Americans have never heard of or do not have an opinion about these leaders. North Korean Leader Kim Jong Un's favorable rating is in the single digits, at 6%, while Russian President Vladimir Putin's is not much higher, at 13%. Only 4% of Americans have no opinion of these men, leaving about eight in 10 viewing each unfavorably. Americans' views of several of the leaders measured are highly partisan. Republicans are far more likely than Democrats to feel positively about Netanyahu, reflecting their greater support for Israel and perhaps Trump's own close relationship with the Israeli leader. Republicans are also more positive than Democrats toward Putin, and to a lesser degree toward Kim, although these support levels are still low. Conversely, Democrats are much more positive than Republicans toward Trudeau and Merkel, both of whom have found themselves in Trump's crosshairs since he took office, leading to some rocky public interactions. Although Britain's May has also had her troubles with Trump, her image is less polarized. The British prime minister's U.S. image is up slightly from a year ago when 40% had a positive view of her, including 35% of Republicans, 42% of independents and 42% of Democrats. Since then, her image has improved among Republicans and Democrats while holding fairly steady among independents. Merkel's favorable rating is also similar to last June's, with 39% of Americans viewing her favorably in both polls and 21% to 25% viewing her unfavorably. The percentage unable to rate her has come down slightly from 41% to 35%. Merkel's rocky relationship with Trump is reflected in partisans' ratings of her, with 53% of Democrats viewing her favorably compared with 39% of independents and 27% of Republicans. Netanyahu's current 37% favorable rating is similar to Gallup's last several measurements, taken between 1999 and 2015. Netanyahu was viewed more positively in December 1998 after signing a U.S.-brokered peace treaty with the Palestinians known as the Wye agreement, but he quickly returned to the 35% range where he had been previously. His lowest favorable rating in Gallup's records (23%) came in April 1997 after he narrowly escaped removal as prime minister following an influence-peddling scandal. Putin's favorable rating has been low for several years, registering below 20% since 2013. At the same time, attitudes toward him have grown more polarized, with Republicans becoming more positive and Democrats less positive since 2014 -- the most recent measure prior to Trump taking office. Whereas only 9% of Republicans viewed Putin favorably at that time, 24% did so in June 2017 and 27% do so today. Meanwhile, Democrats' favorability has remained low, in the 4% to 7% range. Americans' ratings of Putin were much more positive at the start of George W. Bush's presidency in the early 2000s. At the time, the two leaders appeared to be working well together, with Bush declaring at one point that the U.S. and Russia were "friends." Gallup maintains separate favorable ratings on Putin, Netanyahu and May from its annual World Affairs survey, conducted each February. However, those ratings are not comparable to the ratings in the latest poll due to differences in the questionnaires. The current measures are asked in isolation, whereas in the February survey they follow a question asking respondents to give their view of each country, resulting in higher favorable ratings and fewer respondents expressing no opinion. Americans are more likely to feel favorably than unfavorably toward four of the United States' most important allies, but the positive outlooks are fairly limited. In some cases -- as with Trudeau and Merkel -- Republicans bring down the overall ratings, while with Netanyahu, Democrats are the reluctant party. With limited trends with which to compare the current ratings, it's not clear whether today's party differences in leaders' ratings are normal or the result of Trump's unusually blunt public statements about many leaders provoking partisan reactions. More generally, it is not unusual for Americans' favorable ratings of their country's diplomatic foes to be highly negative. Cuba's Fidel Castro, Syria's Bashar al-Assad and Venezuela's Hugo Chavez all earned minimal favorable ratings and high unfavorable ratings in past Gallup polling. Muted favorability may also be normal for the leaders of countries allied with the U.S., given that a high percentage of Americans may not be able to rate most foreign leaders. That was the case for Great Britain's David Cameron in 2014 when 40% of Americans viewed him favorably, 12% unfavorably and 48% had either never heard of or had no opinion about him. However, Tony Blair, the British prime minister who famously backed the United States during the Iraq War, broke that mold in 2007, with 65% viewing him favorably, 20% unfavorably and 15% having never heard of or expressing no opinion about him.